← To Screw or Not to Screw: A Matter of Geography? And now for something completely different. I think I have discovered the world’s most useless, utterly pointless wine accessory – the Champagne Parachute. Here’s the premise. When you fire the cork out of a bottle of sparkling wine, the parachute enables you to follow its trajectory and find it. The entire underlying idea here is just plain faulty, wrong – so wrong I can’t even find the right adjectives to express how bad this is. The thought of firing a cork out of the bottle – which will cause the wine to froth out and wasting one of life’s basic food groups – leaves me at a complete loss. Why anyone would do this, I can’t imagine. Morally it has to be wrong. I suspect it’s dangerous as well. The correct way to open champagne without hurting anyone or damaging the champagne is really quite simple. Remove the foil and cage, hold the cork down with your thumb, and twist the bottle – not the cork, the bottle. Counter-intuitive I know but no one loses an eye, windows don’t get broken. You’ll get a gentle, sensual pop, no wine wasted by fizzing all over you or the floor, and better yet, the bubbles actually last longer. Trust me, Susan and I have run repeated tests to ensure the accuracy of this statement. If anyone finds an accessory more useless than the Champagne Parachute, do let us know. We’ve put a link to the website for this device just to show it really does exist. For now, I’m going to ignore a suggestion that if we were to have cork-shooting contests to see who could shake the bottle the hardest, this device would aid in judging the distance. Some people just need a little work. Note: Dom Perignon is the Benedictine monk credited with inventing champagne. 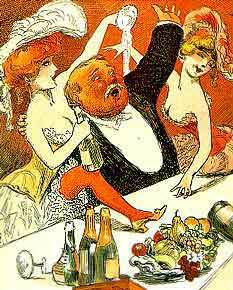 We hope he really did have as much fun as it appears in the saucy illustration above and can only imagine what might have happened if someone really did find the cork that night. This entry was posted in Champagne, Uncategorized and tagged Benedictine, Champagne, Cork, Dom Pérignon, Sparkling wine, Veuve Clicquot, Wine. Bookmark the permalink.